Until recently it was believed to be one of the most important “lost” watches. But on October 26, 2017, the hammer fell and the most expensive watch ever sold at auction changed hands for well over 17 million US dollars. 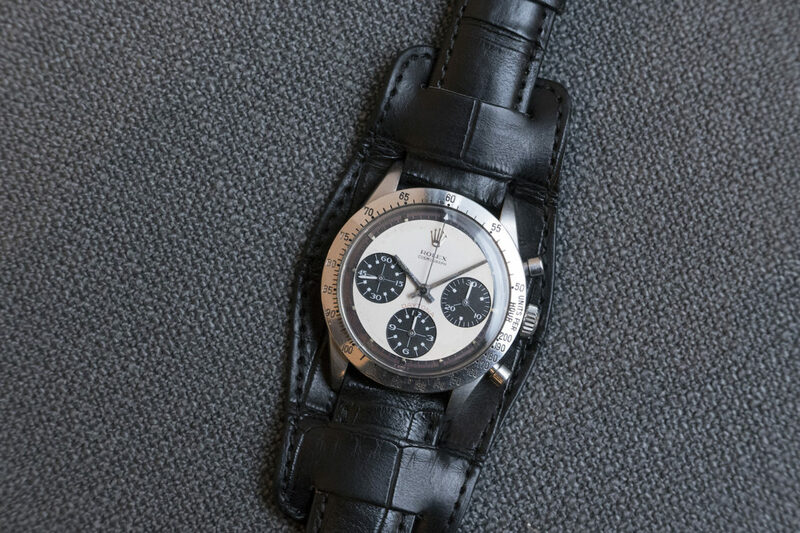 A collector’s piece could never make such a spectacular reappearance in public if it wasn’t for all the fascinating stories and rumors that surround it – most particularly, in this case, by the fact that it was owned by that most glamorous of actors, Paul Newman. We take a trip through the key parts of the watch’s tale. A few blocks from Central Park in Manhattan’s Plaza District, surrounded by exclusive luxury boutiques, auction house Phillips provided a particularly elegant venue for the sale. As expected, the room was packed to bursting. Seats were booked up as soon as Phillips announced the auction, and in addition to the 700 people physically present, many more followed the sale over the phone and online. One of the crowd in the room that day was watch expert and collector Davide Parmegiani, from Lugano. He wanted to be present when what he regards as the most legendary timepiece of the twentieth century was sold. He has no doubt that owning this watch would be a dream come true for just about every mechanical watch collector in the world. He also knew some of the people who were planning to bid; but within a very short space of time, the dream was over for most. The bids quickly leapt from one to ten million dollars. Parmegiani was not surprised. When the auction was announced in mid-2017, specialists knew straight away that Newman’s Rolex would be out of reach for all but the wealthiest watch-lovers. Parmegiani reports that as the bidding raced to 10 million and more, the auction became an intense battle; but once the bids topped 12.5 million dollars, only two potential buyers were left. The way the auction was publicized and staged undoubtedly played a role in pushing the price so high. Internet, magazine and newspaper articles prepared the way for what Parmegiani described as a great event. 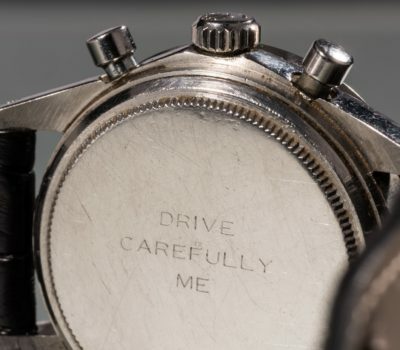 “When I saw how the event was organized, sensed the atmosphere and heard that Paul Newman’s daughter would be attending, I immediately thought the watch would go for more than 10 million dollars.” Shortly before the auction, he estimated in an interview that the price, excluding sales fees, would be 12.3 million. He wasn’t far out. 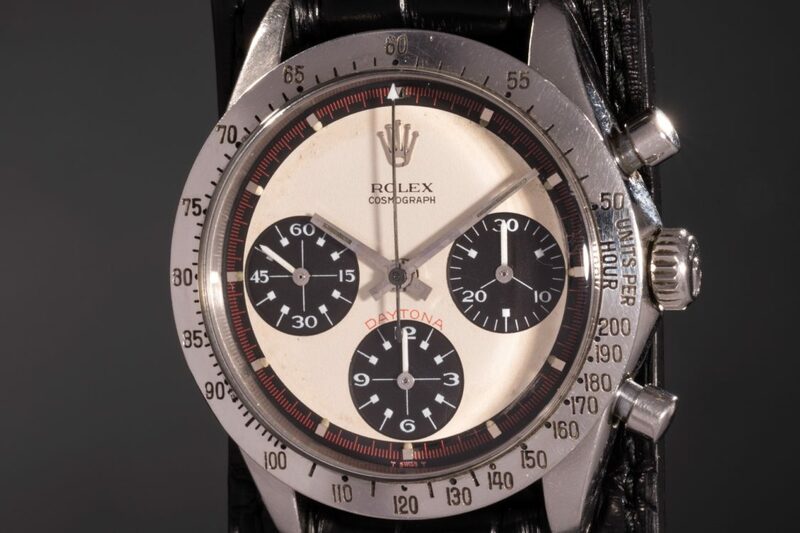 The watch for sale was in fact one of several Rolex Daytonas owned by Paul Newman. Two-time Oscar-winner Newman was given this particular one at the end of the 1960s by his wife Joanne Woodward. He happened to be filming the car racing film “Winning” at the time; he was also a keen racer in real life. All of which explains why Woodward had the words “DRIVE CAREFULLY ME” on the back of the watch. He wore the watch to many of the events at which he was photographed, be it at the wheel of a racing car, in photo-shoots for major lifestyle and fashion magazines, or in private settings. The latter especially shaped the image of Paul Newman, and of the watch on his wrist – a special version of the Rolex Cosmograph Daytona 6239 with three-color dial and characteristic numbering in an Art Deco font. At some point, watch dealers began to refer to this model as the Paul Newman Daytona. Davide Parmegiani describes this renaming as “a bombshell that exploded all over the world”. Suddenly everyone wanted a Paul Newman, and at that time the watch was still affordable for a lot of people: in 1988 you could pick one up in the USA for USD 1,200 – 1,300. Buyers were often not too fussed about the exact details, however, and soon all Daytonas with an exotic dial were called “Paul Newman Daytonas”. 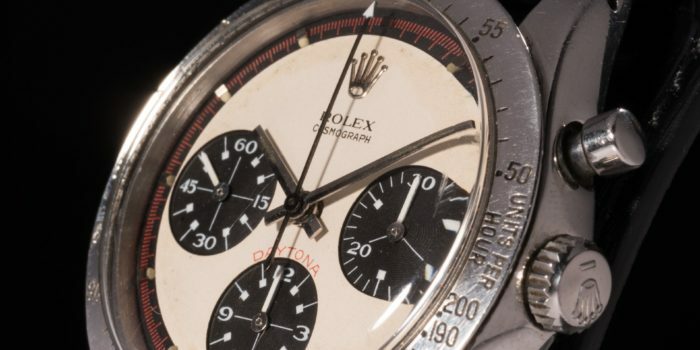 Today, Daytona collections are among the most interesting and valuable in the vintage watch business, and the ones that focus on Paul Newman Daytonas are, of course, especially rare. According to Davide Parmegiani, the Newman watch also kick-started a much broader trend that led to exponential growth in the market for mechanical watches in general. And right from the very start, the Paul Newman Daytona has stood out as one of the real icons. For a long while, the recently auctioned Paul Newman Daytona remained hidden away from all the hype. Paul Newman actually gave it away to a friend of the family in the summer of 1984. One afternoon at Newman’s home, according to the New York Times, the actor asked James Cox, a college friend of his daughter Nell, for the time. Cox was helping Newman repair a tree-house and didn’t have a watch on. So Newman gave him the Rolex Daytona, saying that it kept pretty good time if you remembered to wind it. “As far as he was concerned, it was a tool,” said Nell Newman about her father’s relationship to the watch. For many years Cox, the new owner, knew nothing about its cult status either. To him it was just a nice reminder. Then eight or nine years ago, he noticed that the watch had its own Wikipedia entry. He gradually realized what a rare piece he had been wearing on his arm for all this time. The decision to sell was years in the making, but in June 2017 James Cox went public and announced, via Phillips auction house, that the “long-lost” Rolex was to be auctioned. It’s not just Cox who will benefit from the record sale. A large portion of the proceeds will go to the foundation set up by Nell Newman. Like her father, Paul Newman’s daughter is a committed philanthropist; she is particularly concerned about environmental issues. According to the auctioneers, the successful bid for the Rolex Daytona came over the phone. Watch expert Davide Parmegiani suspects the watch may have gone to a collector in Asia – probably China. But he’s heard rumors on the scene that the watch was bought by Rolex. That would be a clever move by the legendary watch brand, thinks Parmegiani. After all, it was this very Daytona that laid the foundations for the model’s status as a style icon. Using this watch as the centerpiece of its sales pitch to the next generations of Daytona wearers would be a smart marketing move, and therefore a sensible investment, according to the Lugano-based watch expert. Who’s the king of cool? As with the jewelry industry, the big watchmakers depend on getting their products on the arms of famous people at just the right moment. Rolex’s rival TAG Heuer placed its Monaco 1133 on the wrist of Steve McQueen in 1971 when he was racing round the track in the film “Le Mans”, looking just as cool as Paul Newman had a couple of years earlier. This watch also acquired cult status. Some years ago, the original McQueen watch that appeared in the film was sold for almost USD 800,000: a considerable sum then as now, but miles away from the result just achieved by the Paul Newman Daytona. People may still argue about who the real king of cool is, but if you’re using watches as the measure, the title goes unequivocally to Paul Newman. Perhaps the fact that the iconic greatness of the watch evolved rather by accident makes the story of the Paul Newman Daytona even more appealing. The record-breaking auction shows yet again that real luxury is not measured in carats; it actually depends on the compelling story that lies behind a unique collector’s piece.